This is the story of my friend Matthew Epstein, whom I wrote a book about. One summer day, Matt Epstein applied to 20 different companies on LinkedIn to find work. He never heard back a single response. Fear began to creep in. He couldn’t find a job because of one simple reason: He was blending in with the masses. Panic began to race through his mind. Maybe I don’t know what I’m doing. He took a deep breath, stepped back and assessed the situation. And then a stroke of genius hit him. He was going to be bold. Inspiring. Outrageous. Awkward. Funny. Unbelievable. It was in this moment Matt Epstein created the most viral and successful job campaign of our lives. He created a website called “Google Please Hire Me” that was designed in the same style as the Google homepage. I grew up in Florida and I went to UCF, where I majored in marketing and advertising and minored in business. College was a chance for me to get internships and to make connections. A big problem I see in college was the fact that a lot of people were all going to classes, but weren’t leveraging or capitalizing on internships despite that fact that you have an inordinate amount of free time. You’re not starting your career yet so most people don’t take internships until their senior year. It’s a shame. I think it’s important to figure out what you want. Internships allow you to do that. If you love it or hate, you can find out during college by working. Yet a lot of people leave college without any portfolio pieces. The only pieces you have are class pieces that aren’t very impressive. When you have 100,000s of kids going after entry level jobs and you don’t have real corporate experience under your belt, the person who has a portfolio is going to get the job. If you do get a job without a portfolio you’ll most likely get a low paying one. That made sense to me. After all, none of my friends had a portfolio to showcase their projects when they did their first round of interviews. Imagine how differentiated they would be if they did! I actually remember going to the supermarket with my mom, and I would always remember why I would pick one cereal box over another. And I was like, there are reasons I’m picking the Captain Crunch over the Coco Pebbles and that really fascinated me - that there was the power to influence someone’s decisions through marketing. That’s how I became interested in it. So I interned at a marketing agency during college and they hired me. Having a connection through an internship definitely helps you to get your foot in the door to get hired. The agency I worked at for some time was called Definition 6. I moved out to Atlanta and did interactive marketing for 3 years and eventually an account manager. My background was definitely steeped in web. The interesting thing is that I never really learned from a textbook and reading, I don’t find books very interesting. I can’t pay attention to them and I feel like learning a definition of a concept is not the same as experiencing it in real life. Anyway, after a few years, I left Definition 6. Right off the bat, instinctively, I went on LinkedIn and started applying for different companies. I didn’t take the time to ask “What’s my dream job?” Instinctively, I was surfing LinkedIn and also dropping off one or two resumes in person to companies. My resume was cool but there really wasn’t anything special about it. After about 4 weeks of applying to about 20 companies on LinkedIn, I didn’t get a single response back. I was blending in with the masses. I did get a little scared. Ok, I was definitely scared. I started doubting myself. I always knew I wanted to do marketing, but I didn’t have a Masters degree nor did I attend a fancy business college. I started to think, maybe I just don’t know what the hell I’m doing here. Seriously, what the hell was I doing here in the job hunting process? I was applying to things I didn’t even want to do. So, I just took a step back, took a deep breath, and basically re-assessed everything. I had a lot of savings at the time. I began to think, “why don’t I just do something fun for myself so that I know how to do marketing?” I knew that I loved marketing and technology. I also knew I wanted to work with the client side. I was working with ten clients at my previous job but I wanted to work with the brand of just one company. I took a few days to think about what I really wanted to do and I came to a conclusion: How am I going to prove to one technology company that I know what I’m doing in marketing? And that became the driving force. Really, really randomly one day, I just thought to myself, why not create a domain name? Googlepleasehire.me instantly came to mind (I was thinking of big tech companies I wanted to work for at the time). I had no idea what I was going to do with it at the time. Literally. From the time from when I thought of it, to when I bought the URL, I wasn’t sure what I was going to do with the domain name. But it was a start. I figured it out pretty quickly. I was going to create a website similar to Google’s in style as they had just re-branded themselves. The website would fundamentally explain who I was in a funny and concise way and why they should hire me. I knew that people didn’t have long attention spans, so to capture people’s attention, I knew I had to be different. I had to create a video. The question was, what was it going to be about? Bingo! 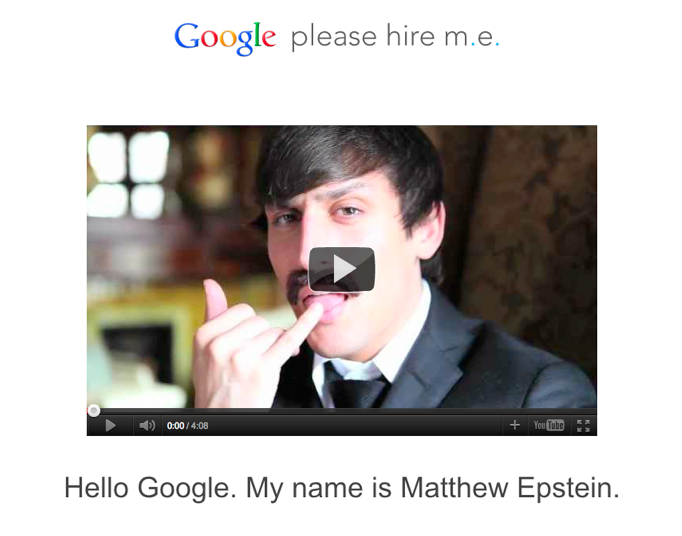 Here was my idea: A fireside chat proposal to Google on why they should hire me. I decided I would try my hardest to make it look like a high end production. I had to create something that would capture their attention, so I tried to make it weird and awkward. I sat and wrote a script for 2 weeks. 1. Website - I built it myself – I know basic HTML and PHP but I downloaded a template and themed it myself. A good tip for people who aren’t really design centric is to utilize products out there like ThemeForce, which already has amazing presentation decks, portfolio folders, career documents, for like $5 a pop. You can also leverage platforms such as blogger.com, wordpress.com that don’t cost anything at all! You’ll also be surprised to learn they’re very user friendly and don’t require you to know code. 2. Video - I filmed it by hiring a few of my friends. I paid them a few hundred each and we used a mansion that took me forever to find. Production value is really important. I really wanted to use high end equipment and the setting was this historic place in Atlanta called Ivy Hall. How did I get that setting booked? Well, I talked them into letting me film there. I could have done this for free if I wanted to. Don’t be afraid to ask for help! If you want to film a video on a budget, you can easily get a low cost HD camera on Amazon.com or utilize your webcam on your computer. The key is to make sure you have great content. 3. Promotion / Awareness – I had all these stunts planned – I had asked myself, What is “off the wall?” to get their attention? I printed out a giant cardboard print out and shipped it to their HR department. .I hired a propeller jet to fly around Google with my URL. It turns out it wasn’t even necessary. Before I knew it, my website went viral in 12 hours. I originally intended to just get Google’s teams to view the website. Today the site has 1,000,000 hits. Here’s how it got viral. A guy posted me on hacker news and I had the #1 story! From there it just spread organically from other people retelling the story. After that, I also did an interview with Gizmodo. 2. Being humorous – People love to laugh. Better yet, people love to share a funny video or idea with other friends. 3. Being secretive – Share a set of “secrets” with the person watching the video – people love to share secrets! 4. Have a celebrity involved – we live in a world where people are in love with celebrity lifestyles, if you happen to have the connections, utilize them! After the story got viral, I got about 80 interview offers, everything from the big tech companies, little mom and pop shops, start ups to just about everything. I actually went to New York to interview with a pretty big start up and Etsy and while I was in New York, I got calls from Amazon and Microsoft. So right after NY, I flew straight to Seattle. Then Google called me for an interview, so that original 2 day trip to NY turned into a three and a half week interview process. I did get offers from a lot of large companies. The fact of the matter is, the challenge with working in big companies is that you’re a little fish in a big pond, and a lot of times you can’t execute your ideas. The reason I did all this was to land my dream job and it was really hard to decide between a start up or a household name. Because when you work 3 to 4 years at a big company, you can basically go wherever you want after that. You’ve got leverage. You’ve got the brand name on the resume. You’ve got the network. The flip side was, if I worked at a start up, there was bigger risk (along with more upside) but if the company flops, I’m the marketing guy with no job and no big name experience and now I’m 5-7 years out. So I felt like the risks were pretty high. At the end of the day, I liked building and creating stuff without having a lot of red tape. At a startup, you have the chance to create a new product that can truly make an impact on other people’s lives. You get a lot of control over my creative process and you get to push a product that you really believe in. And that’s why I chose to work at a startup called SigFig. #1 – Go against the grain - I got a lot of emails from HR people, probably around 100 to 200 of them, and they were telling they wish people did more of what I did. The thing I realized is that, it’s not machines that are reading your resumes, they’re people. Just like you and me. If you send out your resume or whatever else you decide to send in, you want to ask yourself, “Will this catch my attention or will people want to read this?” If you’re not getting them a reason to read past line 2, guess what? They won’t. #2 – Understand the Employer’s Perspective – Most people don’t realize how much of an investment it is for companies to hire people on their end (time and money). Making the right hire is a really big deal. If you think about it, the company is potentially going to make such a big investment in you and the only thing you have to convince them is a piece of paper (your resume)! By doing something like what I did, you’re showing that you made a commitment and an investment and that’s ultimately what sets you apart the most. You have 1,000 people that didn’t do much, or you have 5-10 doing this correctly, and these guys stand out. Companies like Apple get thousands of applications a month and on top of that other people have connections within that company – what are you doing to get your piece of paper on top? The paper resume isn’t really doing anything anymore. With so many people unemployed, you don’t really have a choice to just send a paper resume. You’re being forced into doing something different. You need to create emotional work. People connect to that. The responses I got were overwhelming – I received a few thousand emails from people excited about the website. A thousand of those people alone were out of work and had said they were ready to give up. But they didn’t, because this website inspired them to try a new approach. I asked Matt if he had any specific advice for college students. Kids out of college – if you don’t know what you want to do, go work in internships to find out what you want to do. Don’t feel entitled – it’s not about getting your dream job out of college at first. You may have to and most likely will have to put in some work first. The Google thing for me was just a fun project, and I loved what I did. And if you’re applying for a job and doing a resume and it feels like work, then you’re probably doing it wrong. The Google project didn’t feel like work to me. Do what you love. The rest will come to you.